Two sister dailies are urging readers to help fund the “quality journalism” they produce by urging them to make cash donations to the papers. In what is believed to be a regional press industry first, the North West Evening Mail, in Barrow, and Carlisle News & Star have launched an appeal asking readers to help them invest in reporting on the communities they serve. The appeal has been launched via a video message now appearing on the CN Group-owned dailies’ respective websites, with links allowing readers to make one-off donations or become regular supporters via monthly subscriptions. A graphic also appears at the end of each indidvidual story on the sites, with a click-through button where readers can make donations. The CN Group titles are thought to be the first regional newspapers to appeal to readers to help fund their journalism, although national daily The Guardian has done so for several years. 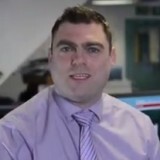 The video message appears on both sites, with the Evening Mail version attributed to editor James Higgins, pictured, and the News & Star’s to its associate editor Chris Story. It reads: “At the North West Evening Mail we’re passionate about providing you with trustworthy local news, articles, features, and information. And we hope you enjoy having the most comprehensive coverage of your community at your fingertips. “Quality journalism does cost money, however, and in today’s digital world – where many websites are misleading you with fake news – it’s important for local newspapers like the Evening Mail to invest in local journalists who care about reporting accurately on the communities they serve. “This can only be achieved, though, if our news websites receive an income in return for that investment. You can help in this enormously by making a small donation for the service we provide online. And you can be assured it will be used for maintaining our high standards of local journalism. The call is accompanied by a ‘No to fake news’ logo and comes after the regional press industry launched a pre-election campaign aimed at combating the phenomenon. 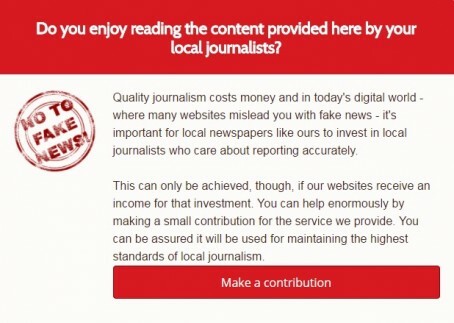 It’s not a call by a local paper for the community to help fund ‘quality journalism’ it’s simply a business asking its customers to donate money into its coffers! Sorry CN, that’s what advertising is for,with managers there to manage the business and directors and FDs there to properly fund the business so look there first. If your sales people aren’t selling enough advertising , presumably because the audience doesn’t see the paper or websites as effective ad mediums,Review the operation before playing the tiny violin of asking the end user to cough up hard earned money to prop up your business. I assume directors and managers have taken salary cuts too before going cap in hand to the public? And bonus packages and reps salaries cut back too? You can dress it up as a call for ‘quality journalism’ or to protect from fake news but this sounds like the end result of a business in dire straits, a situation often the result of bad management, our of control costs or a weakened product with little or no appeal to local business advertisers. Newspapers are like any other commodity or product, if they appeal to the end user there’ll be a ready market, if they have lost their appeal they won’t. I can’t be the only one who remembers how grassroot news sold papers. Did we leave behind dusty Darby and Joan club snippets ( et al) for exciting corporate waffle only to now realise the baby was in the bathwater? Does it matter that pages 1-9 all carry a screaming strap line ? We’ve totally lost touch with our readers. Spend time pounding the pavement and reignite the trust. Fake news was born when reporters became faceless. Let them loose. What’s to lose now ? Can you imagine if someone like Tesco appealed for donations to help pay its business rates so it could stay in a village/town? The papers would have a field day! How about we get more people to pay us 60p or 80p or whatever every day/week and in return we give them a newspaper containing quality journalism. We might even raise more money if we sell some of the space in those newspapers to companies wanting to promote their products or services. Revolutionary? The barrel has not just been scraped , the bottom has fallen out. Ask people to send in copy and pictures for nothing, then ask them to give you some money. Hmm. Wonder why no one thought of this before? The pits have been reached . The so-called bosses should hang their heads in shame. It’s like asking people to a celebratory birthday party and then expecting them to pay for the wine. When a paper gets to this point it is time to turn off the lights or produce something that readers want. This is terrible judgement from CN Group. Their management was flawed over last year’s farcical launch of a pseudo northern regional newspaper, but this just about ‘beggars’ belief (scuse the pun). This is a completely different situation to the Guardian using its membership scheme to raise funds for its journalism – the Guardian is run by a charitable trust, the Scott Trust, and it is therefore a reasonable model for raising funding. But for a privately owned company to start begging for money like this, well it’s just awful. Wow! Can hardly believe what I’m reading on this website lately. This is absolute desperation, I just feel sorry for the staff on the titles concerned. Note to CN Group management. Your business model has failed so pack in now and cut your losses. They’ll be passing a hat around in the street next! I’m sure this used to be called buying a newspaper? This must surely be the final white flag being waved on an already full field of white flags all signs that the people ‘running the indusrty have completely lost touch and in this case given up on producing a solid visble credible publication which now needs the public to keep it afloat. This gives our a massive sign to local people that this paper/ website is not popular or effective enough to finance itself as an advertising medium which I’m sure will delight those poor souls whose job it is to sell it. A video message on site fee people are seeing? Whose bright idea was that then? No that’s the job of the people employed to sell adverts, not the customer! No that’s the job of the editors,managers and board , again NOT the customer! If this is the state things are in it woukd appear to me time to pull the plug before any more losses or costs are incurred. An appeal?? Since when was CN registered as a charity? And what return does an investor get for their investment other than seeing everything else a non investor gets to see for free? Having just read this embarrassing piece i am not sure if CN come across as arrogant believing local folk will happily give them money to continue to run their business for no apparent return? or merely a publisher of papers people have turned their backs on, advertisers aren’t spending enough with and they’ve run out of ideas to generate ad revenue so are handing around the betting bowl? Either way,if that’s the case it seems to me these are two papers completely devoid of a sustainable business plan, no proactive ad revenue strategy in place and without sufficient investment in its own staff or products to remain viable. ‘Employee x’ makes the valid point of asking whether directors and managers have had salary cuts, I think we can guess the answer, but surely this must be the obvious and most honourable route before falling on your knees and asking your dwindling customer/ advertising base to give you some loose change? If any publisher came out and said; due to tough trading,falling revenues,reduced market etc etc our directors,managers and senior staff have all taken a x % pay cut, they’d get huge acknowledgement and kudos from their staff and readers and would benefit by being seen to be doing something positive internally to resolve the situation. Instead, like here, they go the ,seemingly, easy route of asking their customers for a hand out. If that doesn’t say this is a business in trouble and out of ideas I don’t know what does. If this fails to generate sufficient revenue then what next for them? Blame the public for not supporting the paper ? Lay off more staff using lack of additional funding as the reason? Use this as reason for poor quality content and job cuts? Is any publisher prepared to cut higher salaries to help ensure a stronger business with jobs more secure by doing so? If any business isn’t profitable and cannot attract sufficient funding to provide a quality service which people will pay for, and if it cannot attract, in this case, advertisers wiling to pay to reach an audience with an expectation of good response, it’s about time to shut up shop and leave it to those who can. A desperate and embarrassing decision and one which shows complete lack of ownership of the problem. You can probably pull this kind of thing off if you’re the New York Times in the land of Trump, but not if you’re re-nosing press releases from the National Toilet Association. If people are going to donate then what are they going to see for their money? 19 reporters where there used to be four? Probably not. Every single entirely valid criticism raised in these posts could and should have been anticipated by the management. Either they didn’t occur to them, or they did, and weren’t considered important. In either case, the firm’s reputation has taken a hit of horrifying proportions which is entirely self-inflicted. Whoever came up with this idea, whoever approved it and all those who knew better but said nothing should be defenestrated immediately. That ought to improve the balance sheet a bit, if nothing else. I’ve said it before, and I’ll say it again ,and I’ll keep saying it; the problem with British regional journalism isn’t digital, or ad blockers, or fake news, or Facebook; it’s management, or what passes for it.